“My colleagues and I would like to save our academic career, and the university has not treated us well or with transparency”, says Dr. Nakamoto. I (and many colleagues in the University) believe that the University’s procedures for compulsory redundancy have been neither transparent nor fair. The University/School have so far given us only vague and insufficient explanations for the procedures, which contain inaccurate or incorrect information on our research activities, self-contradictions, logical inconsistency, and scientific absurdity. The University/School insists that what have been targeted are research “areas”, not individuals. However, it is obvious that the School has targeted specific individuals (including disproportionally high numbers of ethnic minorities), rather than research areas; they had first made a “target list” of faculty members, and then invented research “areas” for targeted individuals, by picking up “key words” or “labels” of our research from lab websites. “Areas” have been identified as “protein x”. There is no such research area but a protein picked up from a lab website. A researcher has been targeted in an “area” he has never worked in; but there was a former researcher with a similar name, who had been working in the targeted “area” who left the university several years ago. Picture this. New manager arrives at Aberdeen. Consulting with a “School Executive”, an individual with an oriental name is selected for dismissal. The managers know that employment law only permits such a course of action if a reorganisation of the University means that the individual’s role is no longer required. Hence, a reorganisation is announced and certain areas of research are declared unwanted. Which ones? The areas cannot be broadly defined (i.e. neuroscience) for then it won’t be easy to separate those targeted from others to be retained. The managers therefore invent new areas, for example “Electrical Motility and Cell Migration Neuroscience”. It does not matter that this title is scientific nonsense, it does not matter that nobody identifies with a non-existent area, what matters is that “electrical motility” and “cell migration” appear as keywords within a given research group at Aberdeen. In this particular case, however, the managers made another comic – if not as damaging – error, for a second individual with the same oriental name exists, who used to work at the University in the above-mentioned research group from where the new “area” was invented. The careless managers (possibly working from some outdated document) include “Electrical Motility and Cell Migration Neuroscience” in their reorganization proposal, “mirroring” the wrong person, someone who has already left the institution, although the intent is to remove a current member of staff, who studied schizophrenia, with the same name. Instead of the manager(s) losing their post(s) on the spot after such a foolish mistake, the individual with the oriental name is made to go from the University despite not working in electrical motility (of don’t ask what) or cell migration. Why do this sort of managers destroy the UK universities? I explained before a common pattern, where the manager generates a surplus from cuts, then invests this money in business activities that allow profit-making. Such cuts cannot be defended under a transparent system, for they damage education and research, and therefore anyone who can question such a course of action must be silenced. This is a consequence of what has been called the privatization of universities. In the specific case of Aberdeen, some of the money was apparently destined for an investment in South Corea. The manager in question was called as a witness in an Employment Tribunal of a previous dismissal he effected in a similar manner, where he learned that the University cannot simply dismiss a member of staff because it has decided to disinvest in the particular area of research undertaken by a given academic, but that the University is legally obliged to offer redeployment at the time of dismissal. What has this protection offered by the law meant in the case of Dr. Nakamoto? I should return my Friends of Anchor grant (£10k, until October 2017), because there is “no activity”. The PI of the Bowel & Cancer Research grant (c. £50k, until March 2018) should be changed to Prof. Y, who was a co-applicant of the grant. I am not a PI anymore. Any previous activity in my “disinvestment area” should cease (I have two manuscripts that are very close to submission. What would have been your reaction to these proposals to cooperate for saving your post? What should we do in front of such treatment of colleagues at the University of Aberdeen? I took heart a couple of years ago in seeing a manifesto to reclaim the University and that the university also got rid of the senior management, but it has apparently continued with the same course of action using new henchmen. Situations as the one Caitlin Logan exposes today mean there has not been visible progress. I offer this additional protest and specific information to catalyze the much-needed change in a system that stinks. 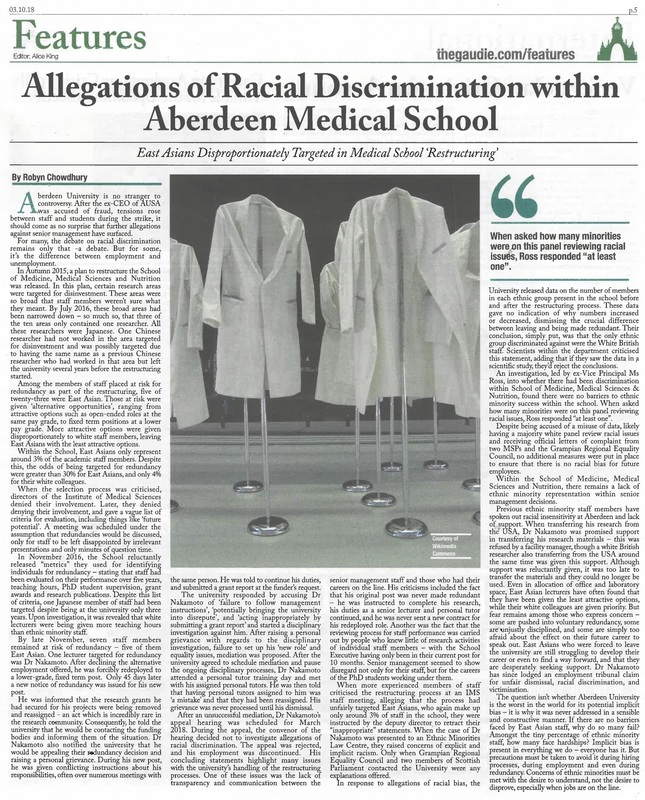 Today I saw another excellent report over the appalling management of Aberdeen University, this time by Robyn Chowdhury, published in the Gaudie.